Each week, I will list a portion of the short paragraphs from the NiceneCouncil.com’s concise but thorough examination of the critical errors with the theological system known as dispensationalism. Of course, dispensationalism is, like most other systems, not comprised of a monolithic group who all believe alike. So please bear in mind this series in not an attack on any person, but an examination of a system. With that, here is the introduction. This entry was posted in Bible Reference Notes, Theology and tagged Dispensationalism. Bookmark the permalink. Great idea. I grew up in a dispensational church. I have attended some dispensational theological institutions (seminaries). I must say, I never understood how they picked and choosed what they would decipher as literal and what was not. However they could force a passage to benefit their theological position is how they would interpret it. I remember even as a child thinking, “this isn’t right.” And as I grew and the Holy Spirit brought illumination on the Scriptures, I discovered I was correct even as a child. My brother, I see that you enjoy reading solid books that assist you in understanding the Word of God. May I suggest therefore that you read the book, “Dispensationalism Today” by Charles Ryrie, in order to understand what dispensationalists really believe as he presents it in his book, going back all the way to some church fathers, before you begin diving into your 95 theses. If you have read it, then please present their stand well. I have heard well known Covenant theologians say things on the radio against the dispensationalist position that were absolutely inaccurate and untrue. Either they hadn’t done their homework, or they weren’t presently the dispensationalist view accurately. Not good scholarship at best. If you are really desirous of knowing why dispensationalists hold their view as strongly as you do to yours, then I would encourage you to get Jack Van impe’s DVD’s on the topic of 3,400 verses that must be denied by those who do not hold dispensationalists/rapture viewpoint! I believe that’s correct. You can call their office at 248-852-5225 to verify that. The bottom line is that both viewpoints are a diametrically opposed and irreconcilable approach to theology. Those on each side of the fence believe their viewpoint is just as accurate as the opposing viewpoint. That’s just the way it is, and that’s ok. It’s not going to change this side of eternity. I think perhaps neither side holds a corner on all the truth and everyone will change their position a bit when we get to heaven. Just my thoughts, my brother. Joe, Thanks for stopping by and being very cordial. I have belonged to dispensational churches for more than 20 years before coming to understand the doctrines of grace. 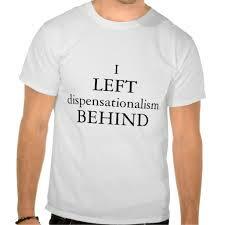 I have heard so much dispensational teaching that I am loath to spend any more time with it. As for Ryrie’s book or Van Impe’s DVDs, no thanks. It’s been a while but I have seen enough from Van Impe to know his understanding of Scripture is detached from Scripture; his “literal, grammatical, historical” hermeneutic is his undoing. Also, bear in mind that most people who are dispensationalists do not know that they are – they haven’t read Ryrie, et. al. Such are the people I am trying to reach. In the reformed world – both Baptist and Presbyterian – there is a similar tendency, to cling to one’s confession more tightly than to Scripture. By God’s grace I intend to cling to His Word above all else. No system of theology is flawless – we ought to work to understand Scripture well enough to tenderly hold to that system which does the least violence to the Scriptures. Dispensationalism – less than 200 years old – is not that system. Stay tuned and see if this series makes sense. It is not an attack on dispensationalism as much as it is a review of the 95 critical points at which it departs from Scripture. Soli Deo Gloria and Sola Scriptura! I’m not sure I understand how you were a dispensationalist BEFORE you understood “grace.” Surely you don’t mean what it seems to imply? I also consider myself a Reformed Baptist, I guess, having been married for 44 years with 4 children and now 11 grandchildren. God has been good! My 10th and 11th grandsons were just born and are premies–twin boys, 2 1/2 & 1 1/2 pounds. The little guy is struggling for his life, having had a few inches of his intestines removed (he has two sacks attached), and he got a staff infection from it. You can visit that story and the pictures on “Praying For Gray And Mason” on Facebook. I’ve been a missionary for over 23 years, working now in a Russian speaking muslim country. I am or have been supported by folks from every theological background, and I’m a member of an Independent Community Church now. I have great fellowship with all these folks and have resolved myself to major on the majors. That has been the glue that keeps us bond together. God’s speed as you endeavor to teach, my brother. I trust that you’ll also continue to be open toward learning, if only to make your teaching as accurate as possible. For example, if you WERE willing to look at the book “Dispensationalism Today” and the teaching mentioned there from some of the early church fathers, you may want to re-consider your statement that dispensationalism is only 200 years old. Might you have learned that from somewhere or someone without having researched all the facts? Just a question. James 3:1. I know you’ve had a bad experience from the past. I think I can accurately guess what that was like, because I’ve had the same thing. However, please don’t throw the baby out with the bathwater or teach from a knee-jerk reaction. That wouldn’t be profitable for you or your teaching. Your fellow soldier in the battle, Joe. “Therefore, because we believe that dispensationalism has at least crippled the Church in her duty of proclaiming the gospel and discipling the nations…” – I think this is a gross mischaracterization of the truth at best. There are thousands of people who have held to a dispensationalist view of the Scriptures and have served as missionaries. In fact, I have seen, in my time, more missions spending and missionary activity from dispensationalist churches than those who hold to Covenant Theology. Second, while I am not a hyper-dispensationalist, I have for many years held to the doctrines of grace. There are many in the dispensationalist camp who also hold tenaciously to the DoG, including myself. Joe, I would have to find myself in a similar camp to yourself with the exception of people like Jack Van Impe and even Charles Ryrie both of whom I would disagree with on many levels including their positions on soteriology and the Lordship of Jesus Christ. I do look forward to reading the articles though, but will refrain from casting out the baby with the bathwater in the opposite direction as well. I know there are some dispensationalists who hold to the doctrines of grace. When I learned of these doctrines, I also learned of the redemptive historical perspective of Scripture and the combination of those things crystallized the over-arching meaning of Scripture for me. Dispensationalism is a recent invention, which many dispensationalists deny or know not. I remain intrigued that so many embrace this view without looking for the answer to the question – if it’s true, why was it withheld from God’s people for so long? The early 19th century was a bust time for new theological systems – none of them comply with the Scriptures..
Before this goes any further, I think you need to define the terms dispensationalism and … undispensationalism. That way, it is clear what exactly you are standing for and against in this series. 072591 – Dispensationalism is not a static, monolithic, fixed system. There are some welcome changes in some adherents to this system, moving away from some of them more egregious teachings of John Darby. Briefly, dispensationalism is a systematic theology based on the notion that the temporal nation of Israel is still the apple of God’s eye, that the church age is a parenthesis so that the Jews would be stirred by envy and turn to belief in Jesus. Dispensationalism sees 7 major phases or dispensations in church history and they brought to us the notion of the pre-trib rapture and the personal anti-christ. Think Tim LeHay’s Left Behind series or, for an extreme example, John Hagee. John MacArthur is a dispensationalist. His view of Scripture has kept him in the New Testament for all 43 or so years he’s been at Grace Community Church. He sees very little of relevance to the Christian in the Old Testament. He is an example of a Calvinistic dispensationalist, though most are Arminian. I will do my best to remember your grandson in prayer. My first grandchild is due, Lord willing, in May. I will not read that book on Dispensationalism – I know how they like to imagine what people might have written long time ago but that doesn’t make it so. But even if it was a 2,000 year old system, like historical premillennialism, I would not read a book on it. I have read enough on each system to know they each have flaws, but I do believe that amillennialism, or inaugurated millennialism, does the least violence to Scripture. In the future, I will post insightful articles expounding these topics – Lord willing. Here is an audio clip of John MacArthur’s position from his own perspective. I believe that it is possible to hold to a position of dispensationalist without falling into the camp of Scofield or Darby. To state though that the belief that, in simple terms, the church and Israel of the Old Testament are two different entities does not do injustice to the Scriptures, nor can it be labeled as merely an offshoot belief that did not appear on the scene until the early part of the 19th century. Part of the problem is that we can often get in a rut and come to the table with our preconceived ideas that everybody who wears a certain label falls into the exact same camps, but this is not true. It would be just as disingenuous to label all dispensationalists as staunch pre-trib pre-millennialists as it would be to declare that all who hold to amillennialism believe in replacement theology. As a further example, for years, dispensationalists have argued with those who adhere to Covenant Theology. Most swore up and down there was no middle ground until some began to argue for New Covenant Theology (NCT). So many branches and there will be no clear 100% answer to all the questions pertaining to things like eschatology. I am thankful though that there is at least one thing for certain – Jesus Christ is coming again just as He left – in the clouds and visibly for all the world to see. Very good, Mark. I am thankful for dispensationalists who have departed from the original scheme of Darby. Yet even one as faithful to the gospel as MacArthur has been hampered by his dispensational view to think there is very little in the Old Testament of value to the church. Within the Covenant Theology “camp”, I am thankful that some Baptists are realizing there’s a difference in the way Baptists look at the covenant than how the Paedobapists do – and the paedobaptists have written lots more books on this than have the Baptists. Most people outside of the reformed Baptist camp know next to nothing about the Baptist view of covenant theology. Many within know nothing about. Since you have not defined what a dreaded dispensationalist is let me state that if you attend a worship service on Sunday and do not bring an animal to slay you are a dispensationalist! If you are a strict Covenant then you need to worship on Saturday and bring an animal to slaughter, correct? Good study on a subject I’ve always had a problem with and could never really grasp the narrowness of the dispensational thought process. Where can I get one of those cool T shirts? Dave – thanks for stopping by. You can find that shirt on Zazzle.com – a place I’ve used to have custom 5 Solas T-shirts made. Thanks Manfred. I probably wouldn’t buy one of those T-shirts, but I got a good laugh when I saw it. I did actually laugh out loud. You could say I’m neither dispensational nor covenant. I consider myself Biblical. But, the study is ongoing. I have family and friends on both sides of the issues. Thanks for this excellent and well reasoned, as always article. I am a 5 by 5 Christian. five points of monergistic soteriology and the five Solas.I have deliberately refused to join either the camp on this topic as well as any eschatological camps. I think I have discovered some inconsistency with the hermeneutical practices in all camps. The reformed camp seems to want to extol Origen while all but ignoring those who came before. Origen came from the church of Alexandria. Alexandria was infamous for its metaphorical if not mystical hermeneutics. Alexandria was also a hot bed of the Persian dualistic Gnostics. they were very keen on embracing the spiritual above the physical. they embraced the teachings of the two Israel’s the spiritual and the physical. I have heard some covenant teachers assert that Rom: 28-29 teaches the literal Christians are now literal spiritual Israel. They seem to ignore Jer. 9:26 which laments Jews being Jews outwardly but not in their hearts. It also seems to ignores Gal. 3:28 which explicitly teaches that Christians are neither Jews (spiritual or literal) nor gentiles. I have heard and read many dispensationalist violate common sense to explain away Rom. 9:13 “Esau I hated’. They run back to the OT and impose it upon the NT to refute predestination and the context be damned. All this to say that whatever our preconceptions on whatever topic when a verse or passage doesn’t quite fit just live with it rather than doing violence to the text to conform it to our own image. We are all guilty of inserting some subjectivity into our theologies. If this were not so we would all be of one accord and united, for God IS NOT the author of confusion. 1. I have a closer walk with God, and am better able to reflect His character in my life, and bring others to a saving knowledge of God’s Love for them through Jesus Christ because my dispensationalist position helps me to/by __________________. Dispensationallism is a great academic/intellectual/armchair pastime and diversion — I hope the time and attachment you give to it does not eclipse — or even infringe in the smallest way — on the time and attachment you spend with God and truly serving Him. Otherwise, if causes you — or worse, someone else — to stumble — CUT IT OFF — GET RID OF IT. I’ve never heard anything from any dispensationalist point of view that brought me closer to God, made me love God more, or either increased or decreased my knowledge and sense of God’s Love for me.